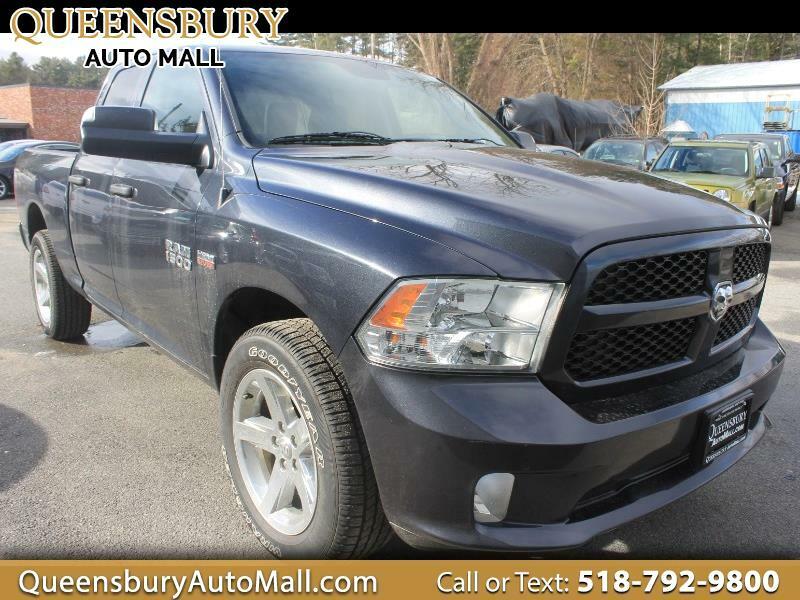 ***LOW MILED 4WD 2016 RAM TRUCK - HERE'S A BEAUTIFUL ROYAL BLUE 2016 RAM 1500 EXPRESS QUAD CAB 4WD TAX TIME SPECIAL AT QUEENSBURY AUTO MALL - COME TO 635 GLEN STREET IN QUEENSBURY, NY 12804 TO GET A BELOW MARKET VALUED RAM TRUCK AND SAVE YOURSELF MONEY- TRADE YOUR OLD RIDE INTO THE AUTO MALL AND SAVE MORE $$$ - DON'T MISS THIS POWERFUL HEMI WORK HORSE FOR THE RIGHT PRICE, LET THE AUTO MALL FAMILY UPGRADE YOU TODAY*** 5.7L V8 OHV 16V HEMI MOTOR! CLEAN CARFAX HISTORY REPORT! FOUR WHEEL DRIVE WITH LOCKING TRANSFER CASE! TOW PACKAGE WITH TRAILER HITCH RECEIVER, OVER DRIVE HAUL MODE AND ELECTRONIC BRAKING! TINTED PRIVACY GLASS! KEYLESS REMOTE ENTRY SYSTEM! FULL CABIN SAFETY AIRBAG CURTAINS AND SIDE AIRBAGS! 6 PASSENGER SEATING CAPACITY! REAR WINDOW DEFROSTER! FULL CABIN HEATING AND AIR CONDITIONING! PROTECTIVE BED LINER AND CARGO BED LIGHTING! AM/FM/CD PLAYER WITH AUXILIARY INPUT JACK, USB IPHONE INTEGRATION, AND SATELLITE RADIO! TILT/TELESCOPE STEERING WHEL WITH CRUISE CONTROLS AND ONBOARD DIAGNOSTIC CONTROLS! DUAL GLOVE BOX STORAGE WITH OPEN FACE TOP BOX! ELECTRONIC TRACTION CONTROL SYSTEM! FOG LAMPS! 20 INCH CHROME WHEELS ON FRESH TIRES! CALL our Sales Team at (518) 792-9800 or email: hotcars@albany.twcbc.com or stop into 635 Glen Street in Queensbury, NY 12804!!!! !